Grammy-nominated, Emmy and Peabody award-winning comedian Craig Ferguson brings his “Hobo Fabulous Tour” to the Jo Ann Davidson Theatre at Riffe Center (77 S High St. Columbus) this Wednesday Nov 28 at 7 p.m. These tour performances will be 100% new material and will never be recorded for any form of broadcast or streaming outlet given Mr. Ferguson’s new (ironically) Luddite mistrust of digital technology. Ticket prices vary. 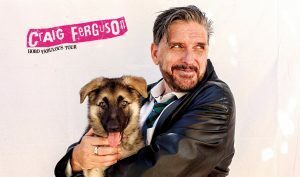 Purchase your tickets today by calling (614) 469-0939, at the CAPA Ticket Center (39 E State St. Columbus) or online at https://www1.ticketmaster.com/craig-ferguson-hobo-fabulous-tour-columbus-ohio-11-28-2018/event/050054CF9EF15E7E.